NIRBHAY (2017 / 2073) is the Nepali movie made under the banner of Prashiddhi Cine Arts. The movie stars Nikhil Upreti, Nita Dhungana, Bikash Chapagain, Sushil Pokhrel, Prajwol Giri, Pradeep Dhakal, Rashmi Bhatta, etc. in the lead role. NIRBHAY is a full action pack movie. Nikhil Upreti has played the role of police officer in this film, which is not new for us, as we have seen him in the same role in many movies. Nita Dhungana has played the role of Nikhil Upreti in the film. Artist : Nikhil Upreti,Nita Dhungana,Bikash Chapagain,Sushil Pokhrel,Prajwol Giri,Pradeep Dhakal,Rashmi Bhatta etc. 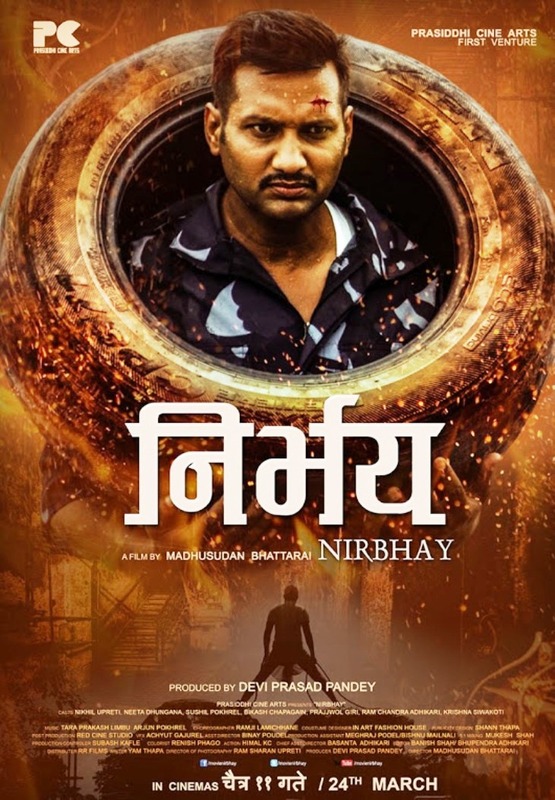 Prashiddhi Cine Arts Presents Nepali movie NIRBHAY starring Nikhil Upreti, Nita Dhungana in the lead role. The movie is scheduled to release on Chaitra 11, 2073.